Bixby is Samsung’s intelligent agent (IA). You can see the Bixby icon here. When you have the camera app on your Samsung Galaxy S9 open, you can tap the icon to launch Bixby Vision. If it’s an object, Bixby Vision can tell you what the object is and how much you can buy it for online. If it’s a barcode or QR code, Bixby Vision can tell you what the code means. If it’s text, Bixby Vision can read it and convert it to text. You can then translate that text into any of 108 languages. If it’s a landmark, Bixby Vision can tell you where it’s located. If it’s a wine label, Bixby Vision can tell you the ranking of the wine and what food pairs well with it. How Bixby Vision works is simple. You open the camera application and point the camera so that it has a good view of the object, document, barcode, text, or wine label (see the following figure). 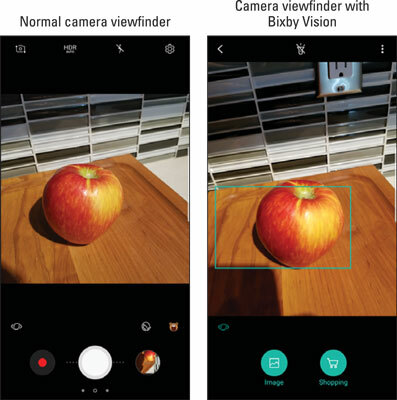 A typical image from the Viewfinder before and after tapping Bixby Vision. When you tap the Bixby icon on the viewfinder, your phone starts trying to figure out what you want. In the figure, it sees an apple and then asks you whether you want it to search this object as an image to find out what it is or whether you’re interested in shopping for this item. Let’s say that you want to buy an apple. Tap the Shopping icon. The results are shown here. Shopping options presented based on the preceding figure. So, I really wanted to get prices on fresh honey crisp apples from the state of Washington. The top choice was a book on nutrition (pay attention, Bixby Labs!). The second guess was Winesap apples, which is a nice option. The book on apples in Iran or winter squash are not as nice. The point is that Bixby Vision does its best to interpret what you want. You see that it presents two icons: one to identify the object and the other giving you shopping alternatives. Currently, there are six options for icons. Bixby Vision icons that may pop up. Bixby will present one or more of these icons based on what it thinks is in the image and what you want. Not only is this fun, but you might save some money when you’re shopping!